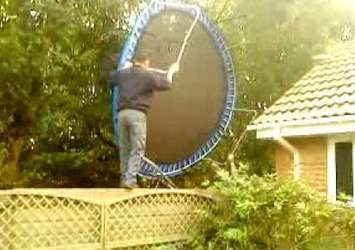 » How to Move a Trampoline Without Taking it Apart? Trampoline Wheels! Trampolines can make a fun addition to any back yard and are a great way to encourage your kids to exercise. Nowadays, more and more American families are deciding to purchase their own trampolines to use at home. However, moving a trampoline can be a pain especially if you have a particularly large model. Many people want to know how to move a trampoline without taking it apart. You may even be wondering if trampoline wheels are a good option for moving their trampoline. Read on for our handy guide. Of course, the most obvious way to move your trampoline is to take it apart and reassemble it in the new location in your yard. However, this can be both time-consuming and inconvenient. If you struggled to put your trampoline up in the first place, it's understandable that you'll be reluctant to go through the process again. The easiest way to move a trampoline without any extra equipment is to lift it up and move it. Assuming you have a very big trampoline, it will be very heavy. Therefore, you'll need some strong and willing friends to help you. At least 4 strong people will be needed to move a large trampoline. Positioning yourselves evenly around with edge of the trampoline frame will spread the weight equally and make it easier to lift. If your trampoline is on a lawn, this can be a little easier as you can try to slide the trampoline. Applying a little WD40 under the legs of the trampoline can make it easier to slide. However, bear in mind that this may damage your lawn a little, although it should recover as long as you apply the WD40 sparingly. You will still need several people in order to shift the trampoline safely. Unfortunately, making DIY trampoline wheels that actually attach to the body of the trampoline is quite difficult and requires specialist metalwork equipment. However, you could try using wheels designed for moving furniture. If you find that your trampoline is very difficult to move because it's very large, you may be better off mowing around the trampoline frame. You could use a scythe or an edge trimmer to do this. However, if you want to mow your lawn thoroughly, you'll have to move your trampoline. Either sliding the trampoline across the lawn using a little WD40 or lifting and moving it will work. You will need several strong helpers to assist you with this, as most trampolines are too heavy to move on your own. Alternatively, you could purchase special trampoline wheels to make moving it easier. With this method, you may find that you are able to move the trampoline on your own if you are reasonably strong. However, you may wish to consider using a professional mowing service to mow your lawn. While this can be pricey, it takes the stress out of attempting to move your trampoline yourself. Before you hire a tradesperson for this job, let them know that you have a trampoline and you want the lawn where the trampoline is to be mown. They may need to bring helpers to carry this out safely. 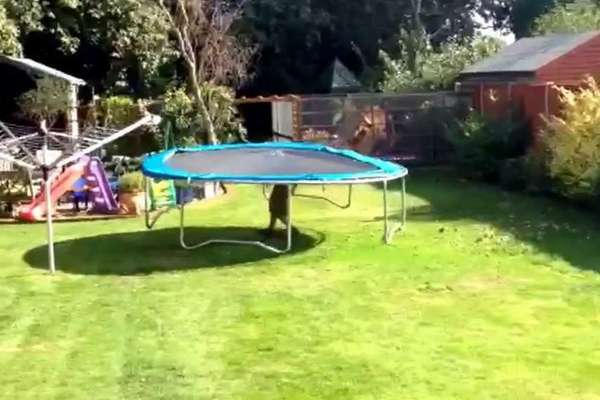 Finally, some people decide that having a lawn area under their trampoline is simply too much hassle because they have to move the trampoline every time they want to mow. For this reason, many people choose to kill off the grass in the area where their trampoline is placed and replace it with paving or gravel. This removes the need for mowing under your trampoline at all. If you have a very large trampoline, then chances are it's extremely heavy. This is because trampolines at usually made of galvanised steel to make them sturdy and rust-resistant. It's really not safe to attempt to move a very large trampoline by yourself as this could cause injury. Instead, you will need at least 6 people to help you move your tra﻿﻿mpoline if it is a very large model of around 16 foot. You should space yourselves out at regular intervals around the frame to spread the load and make it possible to move. You may need to move it in short distances, resting in between. Trampoline wheels can make this process much easier. If you don't have people available to help, you may want to hire in some local handymen to help you move the trampoline. While this comes at a price, it may be worth it to have your trampoline moved safely. Hopefully, you now know how to move a trampoline without taking it apart. 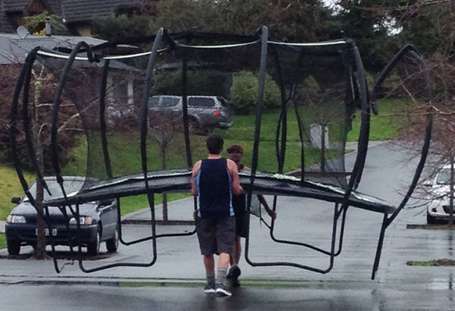 This can make moving your trampoline much more convenient. You may also find that purchasing special trampoline wheels makes the whole process more hassle-free, allowing you to move the trampoline with less people. As we've mentioned above, it's always best to have helpers to move your trampoline if at all possible. 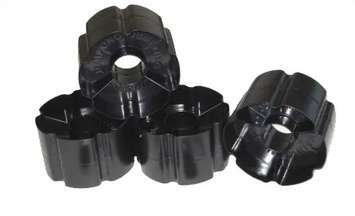 This will make moving your trampoline safer and an help to prevent you injuring yourself. Happy bouncing!